Sticking with the UK, Orange has started selling its first bundle of a mobile broadband dongle with an Asus laptop. 3 UK has also started selling packages in partnership with HP, and T-Mobile is offering an Acer laptop with a broadband package costing £30 (US$55.15) a month. Clearly, operators expect to recoup some of the costs behind the laptop subsidies by tying customers into long-term 24-month packages. Mobile operators are also familiar with this model from their handset subsidy experience. None of these laptops come with embedded 3G – though the USB dongles are provided free of charge as well. The big question is – are operators ready to be PC retailers? In addition to selling mobile phones and accessories, Carphone Warehouse also sells home broadband, mobile broadband, laptops, iPods etc. 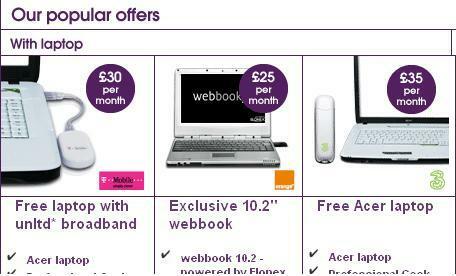 So, it is not exactly a leap of faith for them to start offering laptop bundles with 3G mobile broadband. But are mobile operators ready to take on this challenge? Selling laptops means having to provide after-sales support that requires new skills for staff unaccustomed to such devices. Admittedly, laptop prices are coming down, but the real hidden cost is customer service and support. Maybe there is an opportunity for operators in Central and Eastern Europe where broadband as well as retail markets are traditionally less developed. In fact, in Slovakia, Orange began selling laptops some 18 months ago and has already become the country’s third-largest channel for laptop sales. But it remains to be seen how operators in developed markets fare given that ultra-low mobile broadband prices are already squeezing their margins – they would rather not incur additional costs for laptop after-sales service and support. I think for the time being it would be unwise for customers to take the laptop offers from the mobile broadband providers. Obviously for many it is an affordable way to get their hands on a new laptop but the downside is getting tied to 18 month-2 year mobile broadband contracts. The way mobile broadband is currently taking off there is a good chance we will see what happened with standard home broadband in that speeds and infrastructure increase, the prices reduce and users receive more data transfer. A year down the line and that mobile broadband deal with the laptop may end up costing you much more than far better deals on the market. That said, the offer will be great for some people and providing they have thought about and are happy to be tied into a long contract then they can go for it. Mobile broadband providers have been falling over themselves to offer mobile broadband with free laptop packages in the past few months. These bundles are a great way to get online if you don’t already have a laptop without parting with a load of cash up front. It’s worth noting that none of the laptops are really free – the monthly cost is always less if you just want the broadband dongle. Work out your figures carefully before opting for the temptation of the free laptops deals, they may end up costing you more in the long term.